Most musicians toil away in obscurity. They write songs in their bedrooms and practice in dingy basements. They suffer loud bar gigs, fighting to be heard above the ball game or the drunks. Sometimes that grind pays off — the songs turn heads, more bookings follow. Some bands even have a good run, maybe make a record or two, and become minor celebrities in their hometown. When they break up years later, maybe folks remember them with fond nostalgia. But what if it didn’t work that way? What if fans, bloggers, labels and press followed your every move simply because, well, you’re making moves? Welcome to the charmed life of Kyle Thomas, a Brattleboro-based musician and the creative mastermind behind rising indie sensations, and recent Sub Pop signees, Happy Birthday. Sure, he lives in a tiny studio and is pretty much broke all the time, but Thomas is rocking an extraordinary, fortuitous run. It all began when he and fellow record-store employee Kurt Weisman created the eight-person freak-folk collective Feathers in 2004. That band caught the ear of Devendra Banhart and contributed to the freak-folk impresario’s 2005 album Cripple Crow. In 2006, Feathers released an eponymous CD on Banhart and Andy Cabic’s Gnomonsong label. Truly, Thomas and company fit in perfectly with the psych-folk movement of the early aughts — in one press photo, eight lily-white longhairs in acid-head face paint peer out from behind tall field grass. 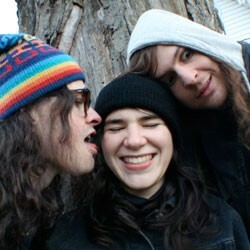 As Feathers were recording and gigging, Thomas began collaborating with Asa Irons — also of Feathers — on songs for Witch, a mystical metal band with heavyweight J Mascis of Dinosour Jr. on drums and Dave Sweetapple on bass. Thomas also played guitar and sang on that band’s eponymous debut album, released in 2006, and the follow-up, Paralyzed, in 2008. Case in point: While playing in a punk band in high school, Thomas started writing songs with more of a pop feel. He decided to record them by himself and play all the instruments. He called this personal project King Tuff. He had a completed record in the can when he put together a live band to go on tour with dance-punk duo Matt & Kim in 2006. As is often the way with these things, one of the guitarists in the live version of King Tuff happened to be friends with one of the guys who runs The Colonel Records, a record label in Brooklyn. The latter suggested his label should put out the King Tuff record on vinyl. Thomas rerecorded and remastered the songs, and Was Dead was released in 2008. That record reveals Thomas in a self-created throwback bubble; his shaggy pop suggests he looked at himself in the mirror and imagined what it was like to be in ’70s glam-rock bands such as T. Rex. A few of the songs, such as “Sun Medallion,” attracted attention across the web from MySpace to the blogosphere, and eventually from the music fanatics at legendary indie label Sub Pop. When King Tuff performed as part of a Colonel showcase at the 2009 South by Southwest Conference in Austin, Texas, Dean Hudson of Sub Pop was in the crowd. Soon afterward, Hudson began texting Thomas to tell him the label wanted to release the next King Tuff album. But Thomas had another idea. He had started a new project with his best friend, ex-Feathers singer and drummer Ruth Garbus, and her boyfriend, guitarist and singer Chris Weisman. It was called Happy Birthday. Hudson’s texts to Thomas reached a crescendo right as Thomas, Garbus and Weisman — Kurt Weisman’s older brother — were recording Happy Birthday’s debut in Brattleboro with Burlington audio-auteur Ryan Power. Within days, the band went from “recording an album” to recording an album for motherfucking Sub Pop. Thomas admits, with the hint of a smile in his voice, that there was some pressure. The resulting album, Happy Birthday, was released in March 2010. 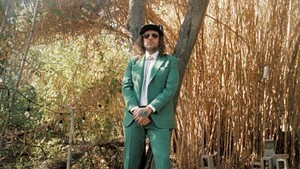 Though this band has been Thomas’ focus for the past year — the group just finished a West Coast tour and are prepping to go to the UK — the label actually signed Thomas on the strength of the King Tuff record. At the moment, he has enough songs for both projects. Opportunities for Happy Birthday keep knocking on Thomas’ door. As if the upcoming UK tour weren’t exciting enough, on September 14 — the day after an appearance at Winooski hotspot The Monkey House — the band hits the road with Dirty Projectors, currently one of the hottest indie bands bubbling just under mainstream success. “I’m a little nervous,” Thomas admits. “I feel like I need to, like, maybe add a little math-rock into my guitar playing,” he says, pausing before breaking out in laughter. “The thing that has helped me have some success is that I’ve met a ton of amazing people over the years,” he says modestly. “And the more people you meet, the more opportunities seem to present themselves. Want to catch them live? Catch Happy Birthday with Villanelles and Crinkles at The Monkey House in Winooski, Monday, September 13, 9 p.m. $10.